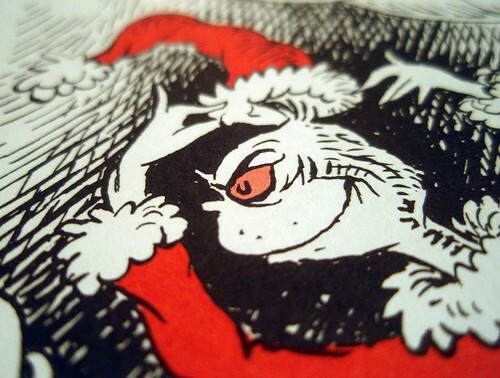 The Grinch in Fairhaven may be a little cheerier than this version. Flickr photo by Mykl Roventine. Looking for a fun alternative to yearly Christmas photos with Santa? Consider getting your photo taken with the Grinch in downtown Fairhaven. Bring down the family, the kids, even the dog or cat with “The Grinch” and his beautiful sleigh. Each Friday-Sunday through Dec. 23, local photographer Tim Chandonnet will be snapping photos of Bellinghamsters getting cozy the Grinch. The photo sitting and a digital photo is $10, with proceeds benefiting Blue Skies for Children, a local nonprofit assisting low-income and foster children. The Grinch will be waiting for you at the Fairhaven Art Market (20 local artists of The Whatcom Art Guild showcasing a wide array of original painting, photography, sculpture, jewelry, textiles and more works) at the lower level of the Waldron Building, 1314 12th St, otherwise known as McKenzie Alley. It’s a little tricky to get to, but if you can find Rustic Coffee, head down the alley. Have fun, and don’t let the Grinch get the best of you!